Library image #4060: Early morning along Jack's Run on the Hickory Creek Wilderness trail, May, 2012. The United States Congress designated the Hickory Creek Wilderness (map) in 1984 and it now has a total of 8,633 acres. All of this wilderness is located in Pennsylvania and is managed by the Forest Service. 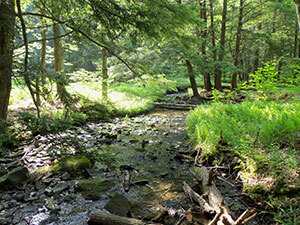 Hickory Creek is one of only two designated wilderness areas in Pennsylvania. It rises from 1,273 feet to a plateau at 1,900 feet. Densely forested, this wilderness contains mostly northern hardwoods and hemlock, with an understory of abundant flowers, ferns, shrubs, and mosses. Bear, deer and turkey are common. Hickory Creek Trail, the only designated trail within the wilderness, is managed for foot travel only. The rolling 12-mile loop provides for easy day hikes as well overnight backpacking opportunities along flat to moderately steep terrain. Access to the trail is from a dedicated parking area just off State Route 2002. The trail may be difficult to follow after snowfall in winter. Planning to Visit the Hickory Creek Wilderness? How to follow the seven standard Leave No Trace principles differs in different parts of the country (desert vs. Rocky Mountains). Click on any of the principles listed below to learn more about how they apply in the Hickory Creek Wilderness.